Saluting Lonnie Johnson, Original Guitar Hero The man credited with playing some of the first recorded guitar solos is today largely forgotten. But a group of Philadelphia-based musicians have just produced a tribute to the early master of blues, jazz and pop. Hear an interview and performance of Lonnie Johnson with Moe Asch, founder of Folkways Records. The guitar solo holds a cherished place in American culture. There's even a popular video game that allows non-musicians to "play" along with their idols. But the man credited with playing some of the first recorded guitar solos has largely been forgotten. Lonnie Johnson was one of the few musicians to successfully straddle the worlds of blues, jazz and pop. Now, nearly 40 years after his death, a new tribute album is trying to restore Johnson's place as the original guitar hero. Called Rediscovering Lonnie Johnson, the name applies as much to the people playing the music as it does to the listeners. Jef Lee Johnson, a guitar hero in his own right, has backed up the likes of Aretha Franklin and McCoy Tyner. He isn't related to Lonnie Johnson — in fact, until he was invited to play on the tribute album, he had never really listened to Lonnie Johnson. "He was insane," Jef Lee Johnson says. "And I mean that in a good way. ... Every track, every take, he's trying to play, like, everything that he can. And he can play everything. It was almost avant-garde, as much stuff as he was playing." It's not surprising that even a pro like Jef Lee Johnson was caught off guard. Lonnie Johnson was a private man. In 1967, he explained to Moe Asch of Folkways Records why no one ever wrote his biography. "Some have started," Johnson said. "They quit for some reason, I don't know. My life hasn't been that bad that I shouldn't tell it. But some parts of a man's life, he keeps it for himself. He don't tell it to the public. " 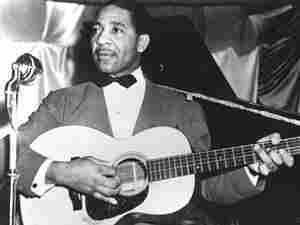 Alonzo "Lonnie" Johnson was born in New Orleans just before the turn of the 20th century. He got his start playing violin with his father. "I just bought an instrument, and in six months I was holding a good job," Johnson said. "I was playing with my father's band — he had a string band." Johnson's father and nine other members of his family died in the influenza epidemic of 1918. So Johnson headed north. He played on riverboats and wound up in St. Louis. By that time, he was playing guitar. In 1925, he entered a blues contest. He won, and landed a deal with Okeh Records. Soon, Johnson was soloing on records by Louis Armstrong and Duke Ellington. These recordings built his reputation as the first jazz guitarist to base his style on single-note melodies, like a horn player — a decade before Charlie Christian or Django Reinhardt. It's an approach he perfected on his duo recordings with white guitarist Eddie Lang, who worked with Johnson under a pseudonym at a time when the music industry was segregated. Lonnie Johnson's first recording contract ran out in the early 1930s, and he spent much of the Great Depression working other jobs to pay the bills. "I went back to the steel mill, and start working again," he said. "Cause I didn't know the nightclub work, and I didn't take any chance. So went back to the steel mill in East St. Louis, and working five years. Started as a sander, and end up as a molder. Molding big box car wheels, that's what I was molding." At the end of the 30s, Johnson went back into the recording studio — first as a blues singer, and later as a ballad singer. At the end of the 1940s, he actually scored a pop hit called "Tomorrow Night." A decade later, Lonnie Johnson was all but forgotten. But in 1959, a jazz radio DJ in Philadelphia played a Lonnie Johnson cut, and then mused on what had happened to the guitarist. "And then I got a call from somebody at the Benjamin Franklin Hotel, someone who worked there," says Chris Albertson, now a music journalist in New York. "Who said, I work with somebody named Lonnie Johnson. He's a janitor, he never talks about music. But he's very careful with his hands. So maybe he is the Lonnie Johnson!" Albertson had Johnson on his show many times in the early '60s, and helped engineer his comeback on the folk revival scene in New York. Albertson also produced a handful of Lonnie Johnson records. Johnson was able to quit his job as a janitor at the hotel, and toured extensively. But he kept his home in Philadelphia, where he'd met Susie Smalls a few years earlier. Smalls still lives in the North Philadelphia row house she bought with Lonnie Johnson in 1960, and where she raised their daughter. "He was just plain," Smalls says. "He never did brag. At all. He just kept his guitar, played his guitar." Johnson's self-deprecating humor and modesty are part of the reason he's not more famous, says Aaron Levinson, who produced the new tribute CD. "People tend to minimize the contribution of folks that don't have roman candles associated with his life," Levinson says. "He had the roman candles, but they were all coming out of his guitar." If Johnson was bitter about the ups and downs of his career, he never let on. "These 68 years has been beautiful, hard," Johnson said. "I can go to sleep, and sleep at night. I won't have to worry about I told someone the wrong direction to go, rather than the right direction. It don't hurt to do a favor." Johnson spent his last years in Toronto, where he died in 1970. Nearly four decades after his death, his guitar solos sound as crazy as ever.